Steve Minshull International | Win new business - present with impact... across the world! This is a powerful, systematic, strategic approach, which will enable all your Salespeople to be at the top of their game and give them the 'edge'. 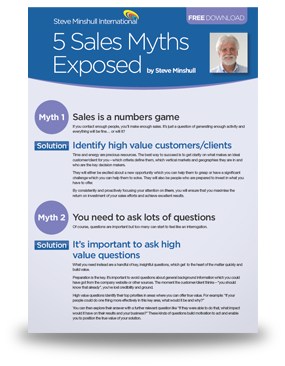 As a bonus to you receiving '5 Sales Myths Exposed', you will also qualify for a complimentary subscription to my occasional newsletters. You can unsubscribe at any time if you so wish. Your information will be kept confidential. Your Sales Leaders are vital role models. By consistently applying the key principles of Selling True Value™ themselves, they will then be able to inspire and coach their teams to adopt a true value-driven approach. This will provide the best opportunity to maximise sales and profitability. My team thought Steve’s course was excellent, giving them a whole new angle on understanding their customers and therefore better meeting their needs.